Browse hanging-chairs-hammocks suppliers by country and region. Archit Acrylic India Pvt. Ltd.
Short on time? Let hanging-chairs-hammocks sellers contact you. Hammock stand in strong steel tubes with power coated to prevent from being rusty; Lying area in 600D Oxford,loading to 120kgs,machine washable; Open size in 245cm total length, 80cm lying width and 70cm height. Carry bag with strap. "Name: SWING SEAT with pillow ""Deli dralon"" Open size:209x118x162 cm Sructure in iron painted with epoxy-powders Tube: 60 mm Canopy:185 g/m2 dralon (acrylic fiber) Seat bottom: mettalic mesh convertible into a bed Cushion:sponge filling, 185g/m2 dralon (acrylic fiber) Color: frame/black , fabric/as on picture. 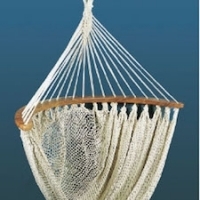 Beijing Luying Outdoor Products Co., Ltd.
Hammock Size:200*100cm Material:nylon rope With spreader bar. Standard exported package. Saigon Forestry Im-Export Co. Ltd.
Hammock, swing. Product dim (mm): l2300 x w1200 x h1350 Carton dim (mm): l1810 x w720 x h135 Nw: 44kgs gw: 46kgs. Finishing : gold, silver, red mahogany, black, white, ivory, dark brown Material : fabric or leather Measurements : w93 x d62 x h180 cm. Based in outskirts of Pudhucherry, we employ and give a self-respected earnings to local artisans, from in and around our facility. Mexican/Brazilian Cotton Hammocks/Swings/Hammock-chairs, are handcrafted by local Indian artisans making them beautiful resting beds are amazingly comfortable. Made from tightly woven 100% cotton rope with nylon ends that cradle your body with just the right amount of support and comfort. A wide array of colors are available. Each Hammock/Swing/Hammock-chair is woven to the artisan's content and the colors he or she uses changes with every sample. We can also give you a specific designed hammock as per your request and liking, in bulk. We do guarantee that every Hammock/Swing/Hammock-chair we make - is esthetically beautiful and very comfortable. Hammocks are not only great for summer relaxation, in fact you can almost use them any time of the year, indoors as well as outdoors. Hammockville Hammocks: 1. Hand made by local rural artisans. 2. Can be used indoors as well as outdoors. 3. Rainbow of colors available. 4. Easy to care and machine washable. 5. Diamond shaped weaving in Rope Hammocks and Mexican Hammocks. 6. Sizes available: Single, Double and Large/Triple. 7. Azo Free Dyes used for colored hammocks. 8. Yarn Dyed fabric for Fabric Hammocks. 9. Natural fabric without dyeing also available. 10. 100% Organic Cotton Hammocks and Swings available with same specifications. 11. We do not use Child Labour. 12. Assured Quality, Deliveries and Services, always. 13. Bulk orders are catered with same quality and services. Mexican/Brazilian Cotton Hammocks/Swings/Hammock-chairs, are handcrafted by local Indian artisans making them beautiful resting beds are amazingly comfortable. Made from tightly woven 100% cotton rope with nylon ends that cradle your body with just the right amount of support and comfort. A wide array of colors are available. Each Hammock/Swing/Hammock-chair is woven to the artisan's content and the colors he or she uses changes with every sample. We can also give you a specific designed hammock as per your request and liking, in bulk. We do guarantee that every Hammock/Swing/Hammock-chair we make - is esthetically beautiful and very comfortable. Hammocks are not only great for summer relaxation, in fact you can almost use them any time of the year, indoors as well as outdoors. Hammockville Hammocks: 1. Hand made by local rural artisans. 2. Can be used indoors as well as outdoors. 3. Rainbow of colors available. 4. Easy to care and machine washable. 5. Diamond shaped weaving in Rope Hammocks and Mexican Hammocks. 6. Sizes available: Single, Double and Large/Triple. 7. Azo Free Dyes used for colored hammocks. 8. Yarn Dyed fabric for Fabric Hammocks. 9. Natural fabric without dyeing also available. 10. 100% Organic Cotton Hammocks and Swings available with same specifications. 11. We do not use Child Labour. 12. Assured Quality, Deliveries and Services, always. 13. Bulk orders are catered with same quality and services. Please note: All mentioned prices are as per 24/10/2009, and subject to change without prior notice. We would appreciate a chance to serve you with the best of hand-made hammocks, with assured quality and deliveries. We also can manufacture hammocks according to your specifiations and requiements, with your label and packaging. We await to honor your orders. Thanking you, kind regards. -- A A Vyas Hammockville Pvt. Ltd. Pondicherry, INDIA Individual Pack, Fabric Carry Bag. Based in outskirts of Pudhucherry, we employ and give a self-respected earnings to local artisans, from in and around our facility. Mexican/Brazilian Cotton Hammocks/Swings/Hammock-chairs, are handcrafted by local Indian artisans making them beautiful resting beds are amazingly comfortable. Made from tightly woven 100% cotton rope with nylon ends that cradle your body with just the right amount of support and comfort. A wide array of colors are available. Each Hammock/Swing/Hammock-chair is woven to the artisan's content and the colors he or she uses changes with every sample. We can also give you a specific designed hammock as per your request and liking, in bulk. We do guarantee that every Hammock/Swing/Hammock-chair we make - is esthetically beautiful and very comfortable. Hammocks are not only great for summer relaxation, in fact you can almost use them any time of the year, indoors as well as outdoors. Hammockville Hammocks: 1. Hand made by local rural artisans. 2. Can be used indoors as well as outdoors. 3. Rainbow of colors available. 4. Easy to care and machine washable. 5. Diamond shaped weaving in Rope Hammocks and Mexican Hammocks. 6. Sizes available: Single, Double and Large/Triple. 7. Azo Free Dyes used for colored hammocks. 8. Yarn Dyed fabric for Fabric Hammocks. 9. Natural fabric without dyeing also available. 10. 100% Organic Cotton Hammocks and Swings available with same specifications. 11. We do not use Child Labour. 12. Assured Quality, Deliveries and Services, always. 13. Bulk orders are catered with same quality and services. We are looking forward to apply for 'Fair Trade Certificate' in 2010. We would appreciate a chance to serve you with the best of hand-made hammocks, with assured quality and deliveries. We also can manufacture hammocks according to your specifiations and requiements, with your label and packaging. Single pack in fabric carry-bag. Master cartons designed depending on the country of export. Based in outskirts of Pudhucherry, we employ and give a self-respected earnings to local artisans, from in and around our facility. Mexican/Brazilian Cotton Hammocks/Swings/Hammock-chairs, are handcrafted by local Indian artisans making them beautiful resting beds are amazingly comfortable. Made from tightly woven 100% cotton rope with nylon ends that cradle your body with just the right amount of support and comfort. A wide array of colors are available. Each Hammock/Swing/Hammock-chair is woven to the artisan's content and the colors he or she uses changes with every sample. We can also give you a specific designed hammock as per your request and liking, in bulk. We do guarantee that every Hammock/Swing/Hammock-chair we make - is esthetically beautiful and very comfortable. Hammocks are not only great for summer relaxation, in fact you can almost use them any time of the year, indoors as well as outdoors. Hammockville Hammocks: 1. Hand made by local rural artisans. 2. Can be used indoors as well as outdoors. 3. Rainbow of colors available. 4. Easy to care and machine washable. 5. Diamond shaped weaving in Rope Hammocks and Mexican Hammocks. 6. Sizes available: Single, Double and Large/Triple. 7. Azo Free Dyes used for colored hammocks. 8. Yarn Dyed fabric for Fabric Hammocks. 9. Natural fabric without dyeing also available. 10. 100% Organic Cotton Hammocks and Swings available with same specifications. 11. We do not use Child Labour. 12. Assured Quality, Deliveries and Services, always. 13. Bulk orders are catered with same quality and services. We are looking forward to apply for 'Fair Trade Certificate' in 2010. We would appreciate a chance to serve you with the best of hand-made hammocks, with assured quality and deliveries. We also can manufacture hammocks according to your specifiations and requiements, with your label and packaging.